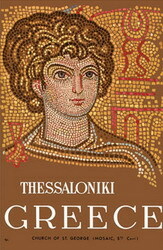 If you are taking a trip to Greece, then probably the second most visited city would be Thessaloniki. A city of great historical significance, the modern day city is a bustling location full of historical sites and modern day conveniences. It's a good idea to stay in a hotel near downtown or the Aristotle Square. This is the main area of the city and there are many sites to see in a relatively short distance. Aristotle Square is a big concrete park for pedestrians only. At the northern end of the square there are ancient ruins for you to walk through and explore, including a Roman Amphitheatre. Going down the south side of the square you'll come to a wide pedestrian only street with many shops, restaurants, and nicer hotels. Here you'll also find American establishments such as Starbucks and McDonalds, which may ruin the Greek mood. Continuing down the street you'll come to the Aegean Sea or the Gulf of Thessaloniki. This is a very peaceful and beautiful walk. It's a great place to take a jog in the morning or take a romantic walk with your spouse. At night, this place comes to life as there are many cafes and coffee shops along the sea. There are many 20-30 year olds that go out every night and it's a great place to hang out to meet new people or just get the experience.There are also some great specialty shops in Thessaloniki as well. You'll see many shoe shops and women's clothing stores. While some of the prices may be a little high (especially with the Euro to dollar exchange rate), you'll still find some good deals. They'll also be tourist shops with everything to Greek armor and Greek helmets to statues of famous persons in Greece history. It will take a day or more just to walk around Aristotle Square and the sea walkway. 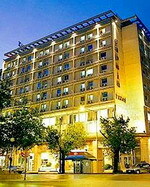 The Astoria Hotel is located in Thessaloniki, Greece, 10 metres from Ladadika Square and 100 metres from Thessaloniki Port. The Turkish Baths, White Tower, and the Triumphal Arch are all 300 metres from the hotel. Drawing influence from Thessaloniki's Byzantine history, the Astoria Hotel combines contemporary amenities and traditional style. Internet access is available throughout for a surcharge. Further amenities include limited hours room service, currency exchange, and dry-cleaning services. 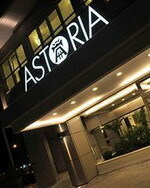 The Astoria Hotel's restaurant serves Mediterranean cuisine. A bar serves Byzantine coffee and cocktails. Three types of breakfasts are available each morning: American breakfast, continental and Grab & Go. The half-board rate includes breakfast and dinner. 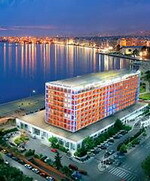 A modern nine-storey hotel, the Capsis Hotel Thessaloniki is located within two kilometres of such attractions as the White Tower, the Arc of Galerius, and the local market. During the summer months guests can take a dip in the rooftop pool or enjoy snacks and drinks under umbrellas on the poolside terrace. The Byzantine-style restaurant serves Greek specialities, while the Irini Bar opens in the evening for drinks and light meals accompanied by live piano music. Another bar, in the lobby, is contemporary in design and offers a range of drinks, cakes, pastries and sandwiches throughout the day. Limited underground parking is available, and guests can use the on-site fitness center Hermes Health Studio that offers 10 ergonomic gymnastic equipment. Guests are close to the local attractions, including Byzantine Churches within 500 metres, the bustling town market one kilometre away and, further afield, the holy site of Mount Athos, a 120 kilometre drive from the hotel. The Classical Makedonia Palace is a nine-storey modern hotel located by the Aegean Sea, 500 metres from the White Tower and the Esplanade. The on-site fitness centre houses a gym equipped with cardio-vascular and resistance machines. Guests can swim or relax on a lounger at the outdoor pool. The hotel also houses a hairdressing salon, shopping arcade, beauty centre and newspaper stand. Guests can choose from four restaurants serving sea food and Asian-inspired dishes. There are also a poolside bar, a lobby bar, and a garden cafe. Local attractions include the harbour- side White Tower, constructed in the fifth century AD, and the Archaeological Museum, both of which are 500 metres away. Visitors can stroll among the cafes and bistros of the Ladadika district, two kilometres away, while the Old City is three kilometres from the hotel. Makedonia International Airport is 15 kilometres away. 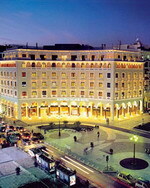 The Electra Palace Hotel is set in a neo-classical building on Aristotelous Square, located 50 metres from Thessaloniki Promenade and 800 metres from the Old City. Guests can indulge in pampering beauty treatments and massages, or use of the hotel's spa offerings such as a hot tub, sauna, an indoor heated swimming pool, and a Turkish bath. For those feeling energetic, there is a fully equipped gym, and on warm days, guests can swim a few laps in the outdoor pool. The hotel offers a plethora of dining options: the ground floor restaurant is plush and bright, and offers all day dining and an a la carte menu; an antique adorned English pub serves traditional pub fare; a coffee shop overlooking the Square offers refreshments and pastries. Nearby attractions include the district of Ladadika, which is known for its vibrant nightlife; the White Tower and the Byzantine and Archaeological Museums, which are all within 500 metres of the hotel. The Castle and Old City are 800 metres from the hotel. The Hyatt Regency Thessaloniki is located three kilometres from Makedonia Thessaloniki International Airport and 13 kilometres from the city centre of Thessaloniki, on Greece's mainland. This modern three-storey hotel is built in a combination of traditional Greek and contemporary styles. Massage treatments, a sauna, a steam room, a spa tub, fitness equipment and an indoor swimming pool are all available. There is an outdoor swimming pool with a sun terrace and poolside bar plus a children's pool. 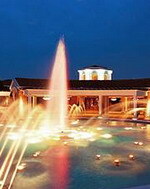 The hotel has two floodlit tennis courts and an air-conditioned squash court. Ambrosia Restaurant serves a Mediterranean menu with Greek influences in a contemporary setting with a terrace overlooking the swimming pool and gardens. The Ocean Pool Bar & Grill is open during the summer months and serves Greek and Mediterranean specialities. Bar Aficionado stocks a wide range of premium cigars, cognacs and whiskies. The Lobby Lounge offers speciality teas and coffees. 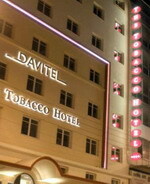 Davitel Tobacco Hotel is a former tobacco house which is situated in a quiet area of Thessaloniki in northern Greece. The hotel is one kilometre from the city centre and three kilometres from the Archaeological Museum. The hotel has a café bar with wood and marble furnishings, and a contemporary breakfast lounge. Staff at the 24-hour front desk offer laundry and dry cleaning services, and can advise guests about nearby parking. The hotel's seven floors are serviced by an elevator. Public areas are air-conditioned, and wireless Internet is available throughout the hotel. Expert Tip: Visit the Byzantine Museum to learn about art, religion and ideology in the Byzantine and post-Byzantine periods. The museum won the Council of Europe Museum Prize in 2005.